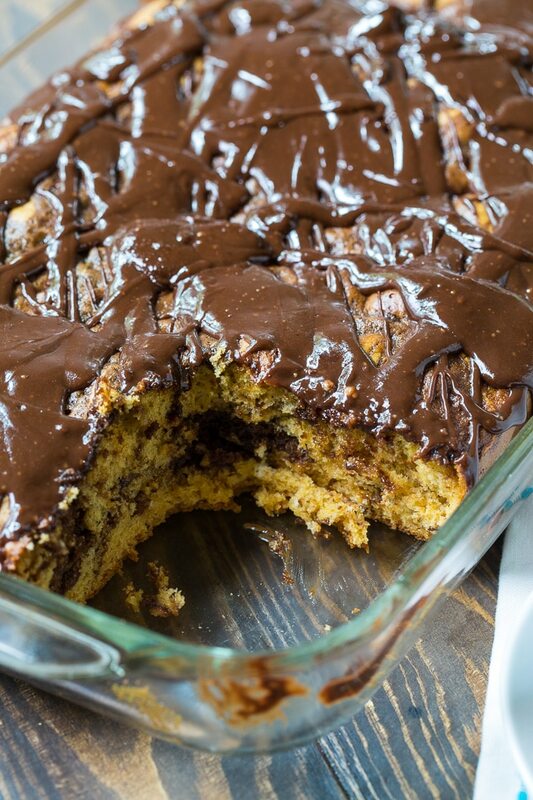 Butterscotch Marble Cake is a super easy dessert. 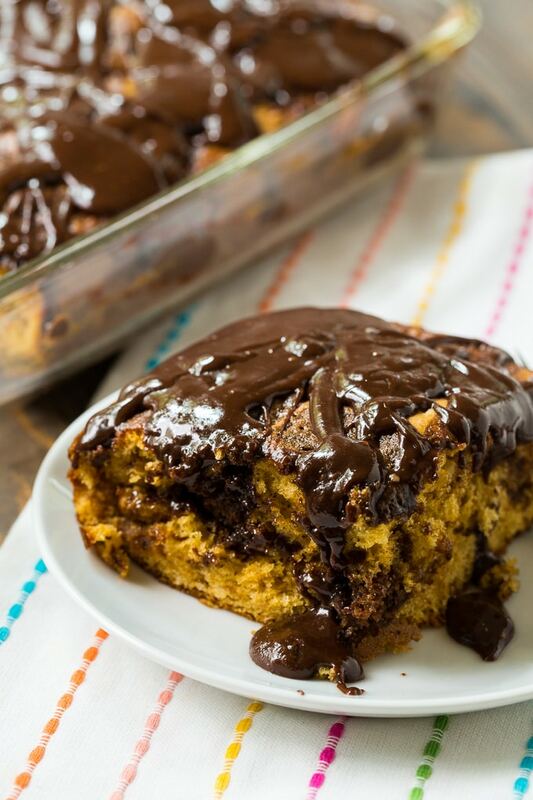 It has lots of butterscotch flavor, a marble pattern, and a rich chocolate glaze. Thanks to a couple of shortcut ingredients you’ll spend no time at all making this delicious cake! Made in a 9×13-inch pan, this cake is perfect for potlucks, picnics, cookouts, or to share at a holiday meal. From scratch cakes are my favorite, but sometimes shortcuts are called for. 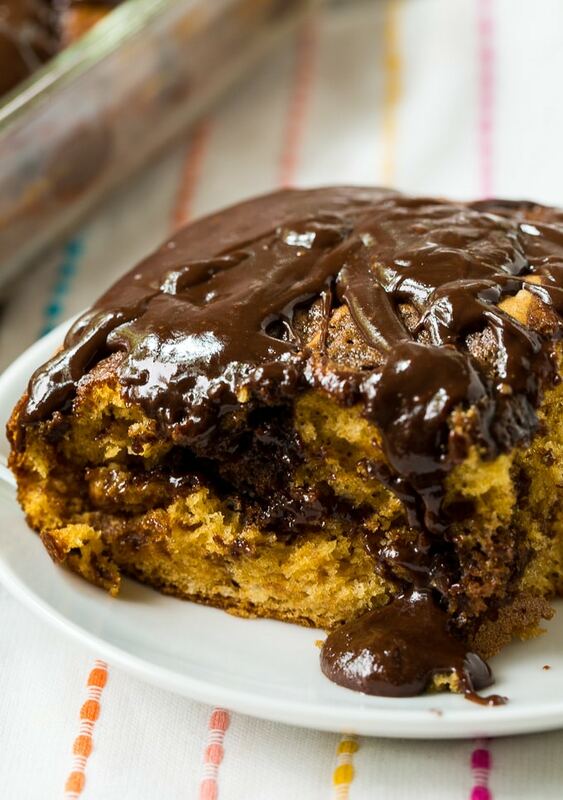 This Butterscotch Marble Cake is made from boxed cake mix and instant butterscotch pudding mix. Thanks to these convenience products, it only takes minutes to get this cake ready to go in the oven and you can be assured it will come out of the oven flavorful and moist. As long as you are careful not to overbake it that is. 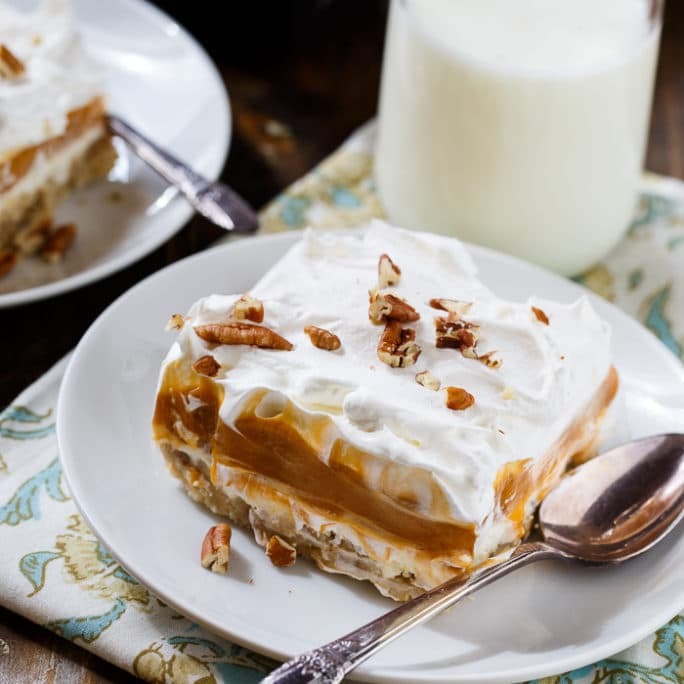 I was a huge fan of butterscotch pudding as a child and as an adult I adore Butterscotch flavored desserts. Especially when joined with chocolate as in this recipe. 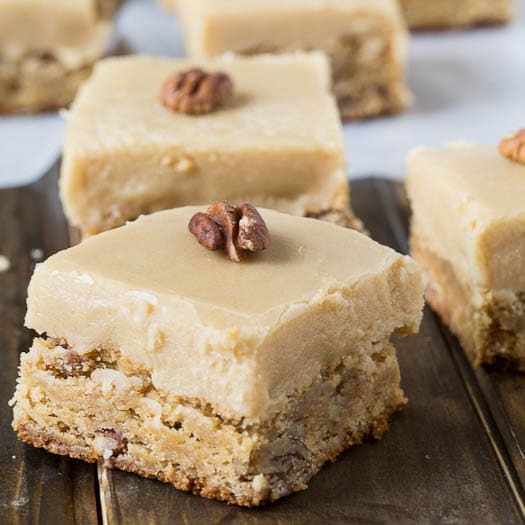 Scroll down for more butterscotch dessert recipes. Enjoy! 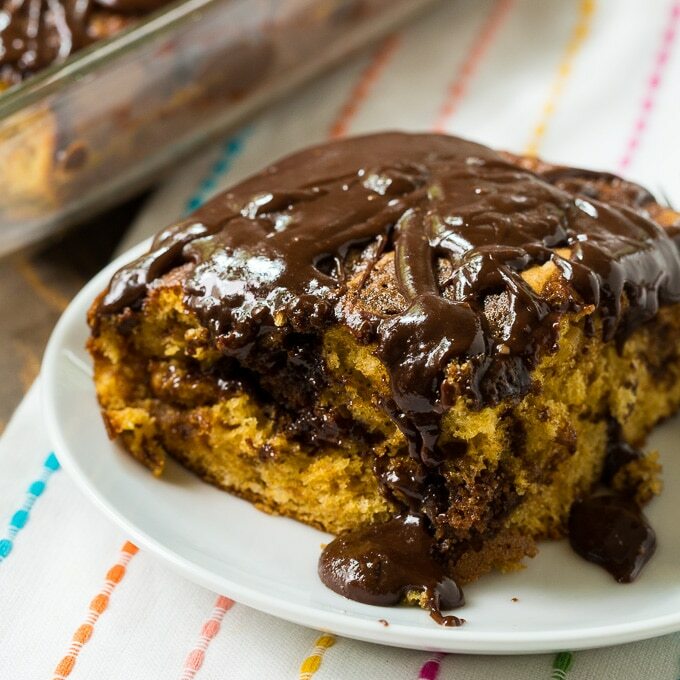 Butterscotch Marble Cake has lots of butterscotch flavor, a marble pattern, and a rich chocolate glaze. Combine first 5 ingredients in a large mixing bowl and beat with an electric mixer on low until combined. Beat on medium for 2 minutes. Transfer 1 1/2 cups of batter to a medium bowl and mix chocolate syrup into it. Pour the batter WITHOUT the chocolate syrup into prepared pan. Drop chocolate batter by spoonfuls on top. Use a knife and swirl through the batters to mix them some. Bake for 30 to 35 minutes or until a toothpick inserted in the middle comes out clean. Let cool. To make icing, combine chopped chocolate and butter in a small saucepan. Heat over low heat and stir until melted and smooth. Remove from heat and whisk in powdered sugar and water until smooth. Drizzle over cake. This entry was posted in Cakes, Desserts and tagged butterscotch, chocolate. Bookmark the permalink.